This, i have to consider as a serious goal in 2014. I've been so lame on keeping this one up. My target is to reach at least 100 posts this year! I'll try my best to put more interesting content. Keep LOI series going, probably more OOTD, more Reviews, more Tags, and some other random/daily posts. Finger cross! I realised that reading the bible helps me through everything in life easier and stronger. This is where i learn about kindness,love and sincerity, also where my faith grows. I admit that i wasn't being so wise on spending money last year. In 2014 i will manage better so i could keep up with last year resolution #5! I need to stop procrastinate, drink more water, be more on time, etc etc. Stop eating noodles and snacking at night! Gotta get back that flat tummy! 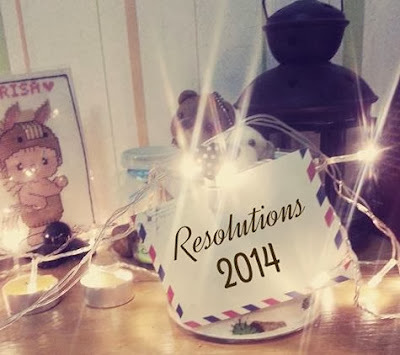 Do you make your 2014 resolutions? Hope to see them all accomplished by the end of the year!